Multiple Interactions – Every marketer knows there is truth in the idiom that it takes multiple touches to convert a cold lead into a customer. This very fact causes complications in allocating revenue to any specific touch point. Timing – Marketers need to make spending decisions today but the outcome of those decisions will produce an uncertain effect at an unknown point in the future. Today’s campaign may deliver results next week, next month, next year or even further away. Multiple Stakeholders and Drivers – Even in an organisation of modest size the buying committee might comprise several stakeholders each with different drivers. In larger or Enterprise size companies the numbers and complexity involved can be drastically higher. Different campaigns affect each stakeholder differently so determining which have the most impact can be problematic. External Factors – There are factors outside the control of marketing with the potential to impact upon the results of any campaign. Things such as economic trends, Brexit, political factors, quality of the sales reps and even the weather can have a significant impact on a marketing campaign. The increasing complexity of these methods add to the associated cost but deliver greater levels of insight. They are summarised in the graphic and, in our experience, making a few well thought out measures is far more effective than trying to track everything and ending up with a stack of inaccurate, inconclusive results. 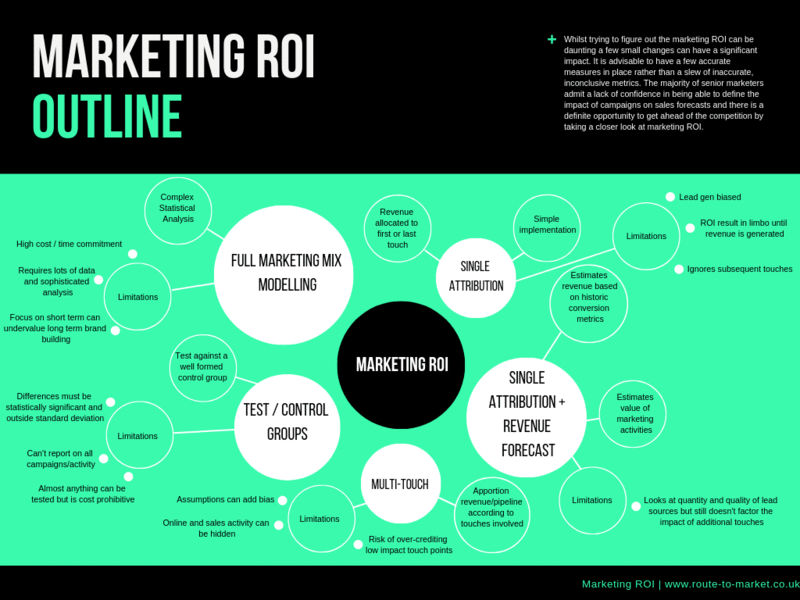 Cost per lead measures have had their day and now it is time to seriously look at, and measure, Marketing ROI.